During the band's early years, In Flames had a varying group of musicians recording with them, including many session musicians. By the release of Colony (1999) the group had established a stable lineup. Their sixth studio album Reroute to Remain (2002) showed the band moving toward a newer style of music that moved further away from melodic death metal and closer to alternative metal. This decision was criticized by fans of the group's heavier metal sound; however, it increased the band's mainstream audience and bolstered their album sales. As of 2008, In Flames had sold over 2 million records worldwide. Since the band's inception, In Flames have released thirteen studio albums, three EPs, and two live DVDs, their latest release being their thirteenth studio album I, the Mask in 2019. In Flames has been nominated for three Grammis Awards. 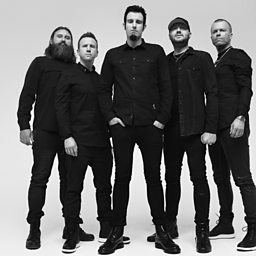 They won two of these nominations; one for Soundtrack to Your Escape (2004) in the "Hard Rock/Metal of the Year" category, and one nomination for their following album Come Clarity (2006) in the same category.